The first half of the chapter of 1 Timothy 2 focuses on prayer, as Paul defined the ‘who’ and ‘why’ we should pray for. In between his call to prayer, Paul emphasizes that we should be praying for everybody, because it is in line with God’s desire for everybody to be saved. The idea of Christ paying the price for our sins is not unfamiliar to us, but in this study we will look deeper into the significance of the term ‘ransom’ and how the gospel of Christ has been testified; that it is true and reliable, and thus we should be praying uninhibitedly for others. who gave himself as a ransom – Surely we’re not unfamiliar with the idea of a ransom. 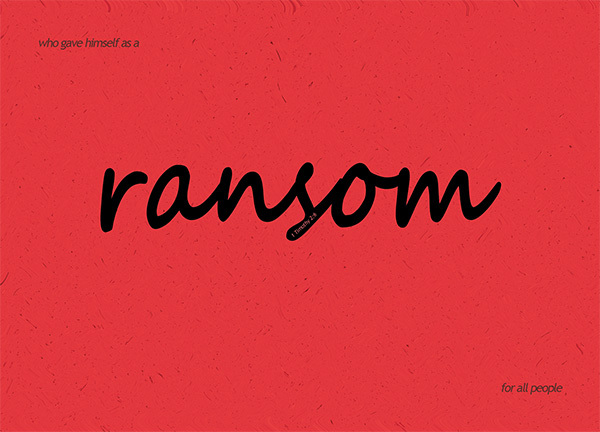 Jesus paid the price for us – this is often heard and often said to emphasize the sacrifice of Christ, but really, ransom is so much more than just a price. A price suggests buying something that didn’t first belong to you. But a ransom? A huge payment made in order to facilitate the release of a property. Jesus gave his life – his body, soul and mind – as a ransom so that we, who belong to God, can be released from the shackles of sin. Christ was the ransom and the sacrifice. In our stead, he died. What does this mean, really? Think back to all the movies on kidnapping you’ve seen. When would a person pay a ransom? Would a kidnapper seize a random person on the street and demand a ransom from you when you don’t even know who the person is? No – men are such that we would only pay a ransom for those we value – those who are important to us; or those whom we love. Essentially, by giving himself as a ransom, there is a statement of intent made here: Christ loves us. He values us. for all people – Really? Did Jesus really die for everybody? If that’s the case, why are there still so many people who died without being redeemed of their sins? Jesus once called himself a ransom, but he never said it was for everybody – just as the Son of Man did not come to be served, but to serve, and to give his life as a ransom for many [Matt 20:28]. It was simply for many. How should we interpret this? How should we understand this? Different scholars have different ways of seeing this, but I personally feel that by dying on the cross for us, Christ was essentially opening the door to redemption for everybody. The verse prior to this says who wants all people to be saved and to come to a knowledge of the truth [1 Tim 2:4]. God’s wish is for everybody to be saved, and in line with the intention of God, Jesus died for everybody. The door of redemption – which nobody could open because we were all ridden with sins – was now opened through the sacrifice of Christ. Everybody now had the choice – to walk through the door or not. Many do – as Matthew 20:28 predicts; but not everybody will declare with their mouths that Jesus is Lord and believe with their hearts that God raised him from the dead [Romans 10:9] – in other words, despite the death of Christ making available to everybody the choice of salvation, not everybody will take it. At least, this is how I would like to understand this verse. You may have an entirely different take on it. This has now been witnessed to at the proper time – Whenever I come across anything to do with the notion of time in the Bible, I get really cautious, because God runs on a different concept of time from us – a concept called eternity which we probably cannot truly grasp. Different versions of the Bible will give you different interpretations of what this line means – some suggest that it means that this message – that Jesus gave his own life as a ransom for all – is valid in every time (all eras). Some suggest it means that the message has already been testified and witnessed; some suggest that the message will be witnessed to in the future. The idea of the appointed time is often emphasized especially with relation to the Messiah. The coming of Christ was at a set time [Galatians 4:4]; the second coming of Christ will be in God’s own time [1 Tim 6:15]; and there is a fulfillment of time when all things in heaven and on earth will be united under Christ [Eph 1:10]. Despite the perceived ambiguity; perhaps a few things are certain – this has now been witnessed – what’s ‘this’? The gospel of Christ, surely. The gospel of Christ, which says that God sent his only son Jesus Christ as flesh to earth for us and Christ died on the cross to redeem us of our sins – who gave himself for us to redeem us from all wickedness and to purify for himself a people that are his very own, eager to do what is good [Titus 2:14]. The gospel of Christ was witnessed by living testimonies at the point of writing during the time when Jesus was still on earth. These people who witnessed it then went around to spread it – that was the first generation of evangelism – live witnesses testifying about Christ. And from then on the gospel has been testified again and again, witnessed again and again, even if there are no longer any live witnesses who had seen with their naked eyes Christ in flesh. In all honesty, this verse probably wasn’t all that hard to understand, but we often stumble on the finer details and confuse ourselves with little things. This is an important verse as it speaks one of the core concepts in Christianity – it speaks about the gospel, it speaks about the role of Christ; and we simply cannot afford to second-guess or doubt this verse, because we would be doubting the role of Christ. Do you believe in the equality of lives? Do you believe all lives are equal, whether you’re a king, or an important business leader, or just a nobody living in the slums? In Christ all lives are equal – and for all these lives Christ sacrificed his own. Indeed, if there must be that one life that should weigh more than others, if there must be that one person whose life meant so much more than others, it can only be the life of Christ. Who are we, that Christ should die for? He is the Son of God! And yet he did it anyway. That’s a huge ransom that was paid for our salvation.